The Digital India programme, launched by Prime Minister Shri Narendra Modi, seeks to change the connectivity landscape of the country. A BCG report predicts the urban internet population to increase to 300 million by 2018. In rural India, the internet user base is likely to expand by up to 40 percent per annum to touch 280 million in 2018. The government envisages broadband highways connecting all corners of the country. This will invariably have far-reaching effects on retail, opening up a floodgate of opportunities and challenges. Add to the mix, the strides in technology in the areas of payments, artificial intelligence, analytics, simulation and hyperlocal, and you have a digital avalanche hitting the stores. ReTechCon 2016 brought together technocrats, business heads and thought leaders to deliberate on how to harness the power of digital to delight customers and grow their business. The Conclave started with a captivating address by Shri B.S. Nagesh, Chairman, RAI and Founder, Trust for Retailers and Retail Associates of India (TRRAIN), setting the tone for the rest of the day. The panel on “Digital India. Digital Retail: Envisioning the future” featured retail heavyweights like Devita Saraf, Founder, CEO and Design Head, Vu Televisions; Bhupesh Dinger, Director – Operations, Enrich Salons & Academy; Nitin Bawankule, Industry Director - E-commerce, Retail, Online Classifieds, Technology, Education and Government, Google India. The panellists were joined by Rajiv Nair, Chief Executive Officer, Celio Future Fashion Limited and Ramesh Menon, CEO, HyperCITY Retail (India) Ltd in discussing how digitalisation is dramatically changing various aspects of retail business. The panel was moderated by Kishor Chitale, CEO – Capgemini Local Business Services, India & Middle East. The Conclave also covered sessions on customer experience, omni-channel retail, payment systems, supply chain optimization, analytics and hyperlocal technologies. A new attraction at ReTechCon this year was ReTech Startup Awards, instituted to celebrate the spirit of entrepreneurship. Out of the scores of entries received, 12 shortlisted start-up companies presented 10-minute elevated pitches to a Grand Jury. The Top 5 winners of the first ReTech Startup Awards are 1. Ultracash Technologies Private Ltd, 2. Senseforth, 3. ftcash (Nomisma Mobile Solutions Pvt Ltd), 4. ShopR360, 5. Uniform Republic. The top 5 winning start-ups were then felicitated at a gala ceremony the same evening. “With their daredevil attitudes and unconventional ideas, start-ups are set to really change the fabric of business and the world we live in. The awards are an acknowledgement of this contribution. We hope they inspire more start-ups to dream and dare, empowering Digital India, powering retail,” said Mr Rajagopalan. 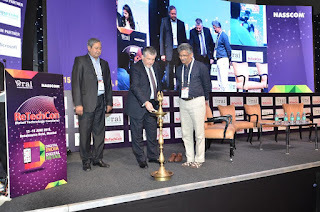 Retail Technology Conclave, popularly known as ReTechCon, is the only knowledge-sharing platform focused on the technology aspect of the retail business. The platform, launched 10 years ago, has grown to become the country’s largest congregation of CIOs/CTOs, technology service providers and experts in the retail technology domain. The conclave is designed to help retailers understand and adapt the rapid changes in technology for the benefit of their businesses as well as consumers.